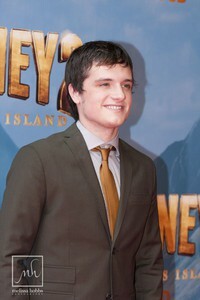 On the red carpet with Josh Hutcherson for the premiere of "Journey 2: Mysterious Island"
Welcome to Melbourne Josh and I have to ask because it looks so amazing on you, but what are you wearing? "Actually I love this suit," Josh said "It's Zaeem Jamal," at which we laughed. Oh, that's the same Designer as Vanessa's dress which we couldn't pronounce and you've just pronounced perfectly. "Is it?" Josh laughed, looking puzzled then opened his jacket to reveal: "Lansdowne. Oh no," he laughed. "I can't believe I told you the wrong designer! And I love this suit, it's my favorite." You're building an impressive career for yourself Josh, can you tell me what it was like working with a Hollywood legend like Michael Caine? "Oh he's amazing, to work with someone of that calibre with that kind of career and amount of time in the business, you're constantly learning from them and there is always something new that they bring to the table. The other thing I noticed, Josh, was how active you are in the movie, riding bikes and even bees, just how did they manage to make you look like you were riding a bee - mechanical bull and blue screen? "Exactly," Josh exclaimed. "Basically, you are exactly right, they had us in front of this blue screen and we're on this kind of mechanical looking bull and it's moving all around and we're acting and saying our lines and doing our thing, to then see the end result is incredible, it's amazing what those guys do." Last question for your Josh. The Rock and that scene with "pop your pecs" how did you manage to keep a straight face? "It was hard I can tell you, there were many many out takes, but it was a riot shooting with The Rock and we had so much fun, it was really great."